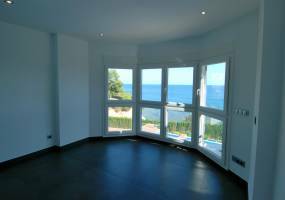 Beautiful fully renovated villa in a contemporary Mediterranean style in Benissa Costa with a beautiful sea view from the first floor.In the lower ground floor is a fitness area with access to the patio, laundry room, machine room / storage room. 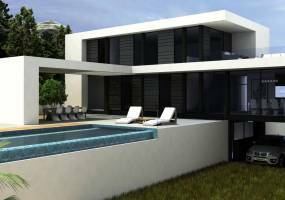 Beautiful modern villa first line to the sea in Benissa Costa only a few minutes from the golf course and 5-10 minutes from the centre of Moraira. 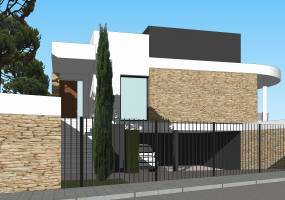 Immediately habitable.The villa consisting of 4 floors as follows:On the lower ground floor: large space for a home cinema, fitness area, toilet and shower and storage room, access to patio. 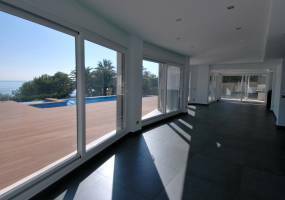 Imposing new build villa in mansion style situated first line to the sea just a few minutes from Calpe. Via a staircase you have direct access to the beach.On the ground floor: entrance, guest toilet, spacious living room with TV area, dining room and modern open plan kitchen with appliances. Storage room/laundry room. Bedroom with en suite bathroom. 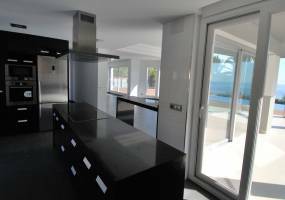 Key ready modern Villa in Moraira with a nice view of the sea and a few minutes car ride from the beach and the centre of Moraira. 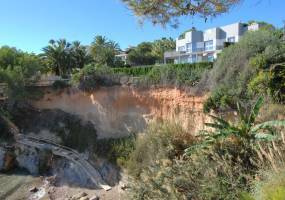 Close to San Jaime Golf Course, shops and restaurants along the coastal road.The villa consists of 4 floors and is as follows:In the lower ground floor there is an indoor pool, seating area, fitness area, toilet and shower, storage room and technical room. 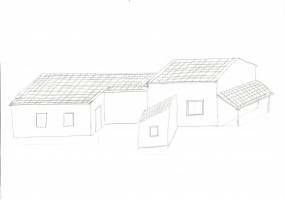 This House will be built with rural features using typical materials such as Arab tiles, wood and natural stone and with very high quality construction qualities and installations as per 2017, for optimal living comfort.The house consists of the main part and guest accommodation. 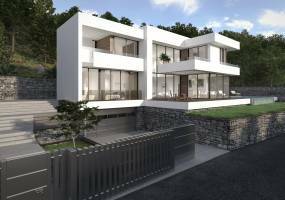 Designer villa to be built "off plan" in Sierra de Altea with breathtaking panoramic views of the sea and 10 minutes from Altea, 5 minutes from the golf course and 15 minutes from the marina.Upper floor: off-road parking, rooftop terrace, main entrance hall with access to other floors via stairs and lift. 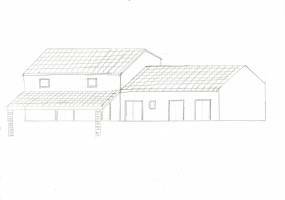 On the first floor: hall, storage/linen room, main bedroom with modern open plan bathroom. 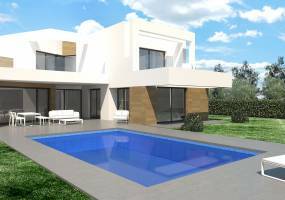 Minimalistic new to be built villa on a plot of choice on the Costa Blanca. This spacious villa has a split level distribution for free flowing spatial living enjoyment.The main entrance is located on the level of the higher area with entrance hall, master bedroom with en suite bathroom, 2 guest bedrooms, bathroom, patio with stairs to lower floor. 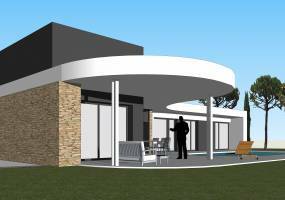 MODEL FH5 is a one storey free flowing 3 bedroom house with circular accents. Living area 179m2 + 50m2 covered terraces. 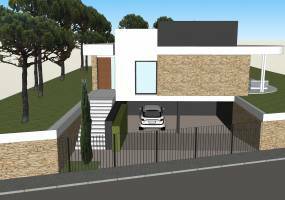 Entrance, hall, guest toilet, living/dining room, modern open plan kitchen, garage with storage, 3 bedrooms, 2 bathrooms, 1 en suite. 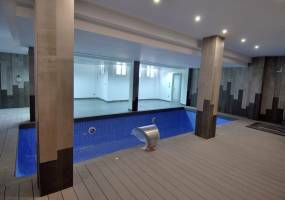 Private swimming pool, covered terraces 50m2 and open terrace. LOCATION, LOCATION, LOCATION ...Very distinctive style new to be built "off plan" designer villa on a unique prime location only a short walk from the old town of Altea with its cozy squares, boutiques, art galleries, bars and restaurants and a short distance from the boulevard and the beach. Villa Angelina is a modern free style villa which can be built on an appropriate plot of choice on the Costa Blanca North.The villa consists of 2 floors, on the ground floor: entrance, hall, guest toilet, living/dining room, open plan kitchen with cooking island, 2 bedrooms with 2 en suite bathrooms. Garage. Covered terrace, open terrace and private swimming pool. 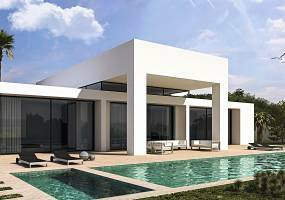 Distinctive design compact villa Noelia which can be built on a appropriate flat plot of choice on the Costa Blanca. Plot is not included in the price. 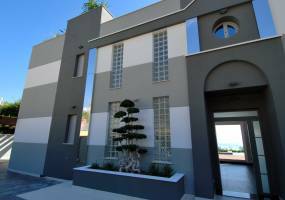 Entrance, living/dining room, open plan kitchen, laundry room, corridor to master bedroom with en suite bathroom, 2 guest bedrooms with bathroom, covered terraces of 34,20 m2. Carport. 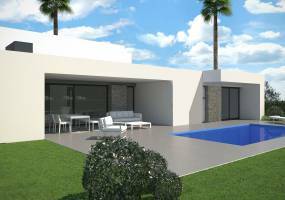 Ideally styled one storey villa Roxana, living area of 155,60 m2 with 40 m2 of covered terraces which can be built on a appropriate flat plot on the Costa Blanca North. Entrance, spacious living/dining room with open plan kitchen, guest toilet, laundry and storage room. On the one side is the main bedroom with walk-in wardrobe and en suite bathroom. 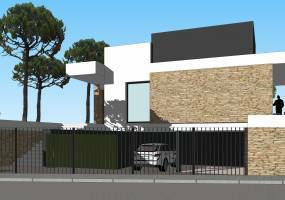 Luxury designer villa under construction in Benissa. South orientation. 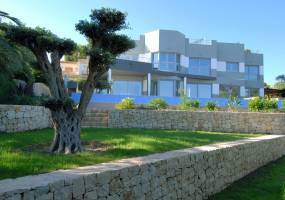 Sea viewsAccommodation comprises: 5 bedrooms, 6 bathrooms, guest toilet, living/dining room, open plan kitchen. 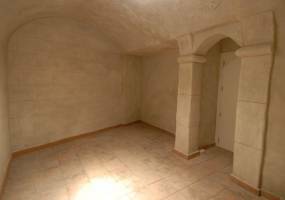 Outside: Covered terrace, BBQ, swimming pool, off road parking, garage, satellite dish.Includes: bodega, gym, home cinema, solarium, jacuzzi, utility room, electrical appliances, underfloor heating. MODEL FH2 is a 3-bedroom one storey model with a surprisingly spacious format. This model is available in several versions from 134m2 + 30m2 of covered terraces to 165m2 + 37m2 of covered terraces. Accommodation: Central entrance, hall, guest toilet, living/dining room with space for office, open plan kitchen, laundry room/storage. 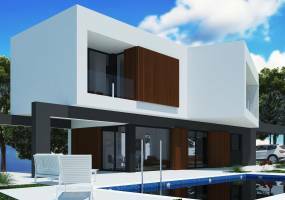 A residential area consisting of 5 modern spacious houses under construction located in one of the most sought after areas of Altea. 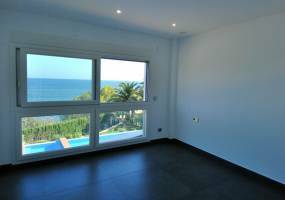 Fantastic views of the sea, with a living area approximately 400m², 3 suite type bedrooms, 4 bathrooms, 2 living rooms, dining room, several balconies, solarium barbecue, parking for 2 cars and plot of 800m². 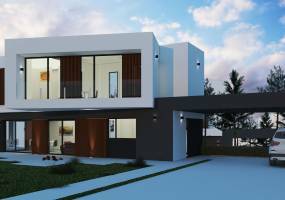 Model FH3 is a one storey 3 bedroom house with minimalist clean lines. Living area 133m2 + 36m2 covered terraces.Comprising: Entrance, hall with a high ceiling and windows for plenty of natural light, living/dining room with open kitchen, laundry room and storage room. 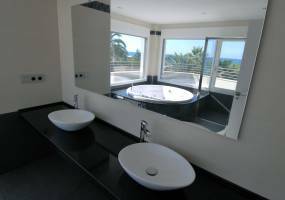 Master bedroom with en-suite bathroom with a view of the swimming pool and 2 guest bedrooms with bathroom. 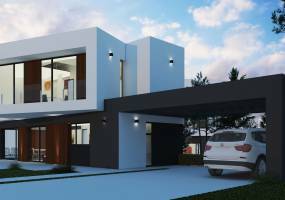 FORM-A Home MODEL FH1 is a revolutionary new to be built single storey 3-bedroom villa with day and night time areas. This model is characterised by its oblique lines and large over-hanging canopy. 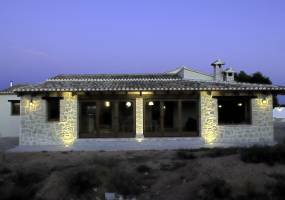 Living area of 171m2 + 31m of covered terraces.Comprising: entrance hall with guest toilet, spacious living/dining room with an open plan kitchen with cooking island and utility room. 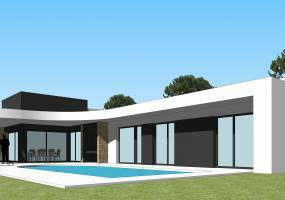 New to be built very modern villa on a plot of own choice (within an appropriate selection) on the Costa Blanca North. 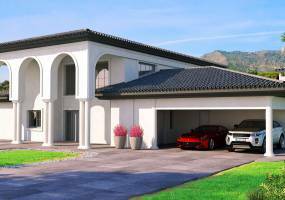 The villa is characterised by clean lines, large windows and a double height of ceiling in the living room for a sense of open space.The lower ground floor has a garage for two cars. 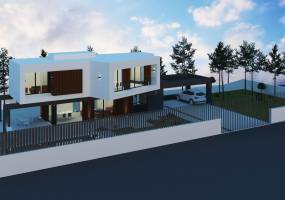 Trendy concrete structure design model Corina (203 m2) developed and priced for construction on a flat plot. This 2 storey villa comprises on the ground floor: entrance hall, internal staircase, guest toilet, living/dining room with modern open plan kitchen with breakfast bar with appliances from Whirlpool and Frecan. Trendy design villa model (189 m2) developed and priced for construction on a level plot.This one storey concrete structure villa comprises living/dining room with modern open plan kitchen with cooking island/breakfast bar with appliances from Whirlpool and Frecan, utility room guest toilet. 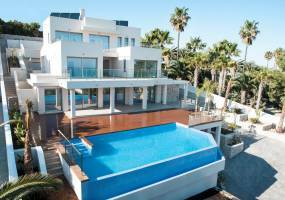 Impressive villa in a distinctive modern Colonial style which can be built on a plot of own choice on the Costa Blanca North. 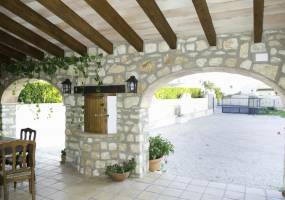 This style gives a new experience to living in SpainThe villa is characterised by clean lines combined with imposing pillars and round arches. 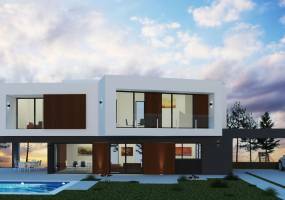 Beautiful concrete structure villa model called Villa Lisa which can be built on an appropriate plot of own choice. 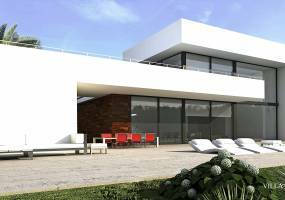 Beautiful concrete structure model villa called Villa Lara which can be built on an appropriate plot of own choice. 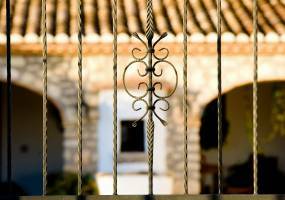 MEET OUR TEAM IN SPAIN AND VISIT OUR OFFICE IN ALTEA.